I had a blast putting together the Zombie Meatloaf. It’s spooky and delicious! The best of both worlds. Use your creativity when assembling these guys. Instead of onions, you could use olives for eyes. Instead of bacon, you could use string cheese and create a mummy instead of a zombie. You could even make small, individual meatloafs. The possibilities are endless! 1 pound of raw meatloaf per zombie head. You can use your favorite meatloaf recipe or try my Medifast Meatloaf recipe. 4 slices of raw bacon (not turkey bacon) per zombie head. 1/4 cup tomato sauce per zombie head. Step 1: If you’re using my Medifast Meatloaf recipe, preheat oven to 350 degree, or whatever temperature is required by your meatloaf recipe. Lightly PAM a 9 x 13 glass casserole dish. Step 2: Using your hands, shape 1 pound of meatloaf into a 1 inch think oval and place into the glass casserole dish. Gently indent the bottom of the oval to resemble a chin. Step 3: Remove the outside layer of the onion. Cut off the ends of the onion. Stand the onion on one of the ends and cut the onion in half. Peel off the top layer, cut the layer in half and taper the ends to resemble an eyeball. Pick up the onion eyeball, gently squeeze the ends, and press into the meatloaf. Squeezing the ends helps the onion stay in place — just pressing the onion into the meatloaf isn’t as secure. Step 4: Remove another layer of the onion. Cut the onion in half length-wise, then cut it half length-wise again. Slice the strips into 1/4 inch wide slices to resemble teeth. Gently press the onion teeth into two rows in the meatloaf. Step 5: Cut the bacon in half. Arrange the bacon slices around the zombie head to resemble flesh. Try not to cover up the eyes and teeth. It’s okay to overlap the bacon slices. Step 6: Spoon the tomato sauce over the bacon slices. Step 7: If using my Medifast Meatloaf recipe, cook for 45 minutes, or whatever your meatloaf recipe calls for. These deviled eggs are so adorable I could almost squeal. I LOVE these little guys. They’re easy, festive, and (best of all) tasty! They’re perfect for an elegant dinner party or rowdy house party, adults or children. Everyone will love them. Give them a try! * To easily peel boiled eggs, firmly tap the top and bottom of the egg on a hard surface then roll the egg to crack the rest of the shell. Cracking the top and bottom of the egg first breaks the seal of the egg and helps the shell more easily release from the egg. ** As an added bonus, paprika turns the egg mixture orange (perfect for Halloween!). Adjust the amount of paprika for your desired level of orange-ness. Step 1. Slice the boiled eggs in half lengthwise. Remove the yolks to a small mixing bowl. Use a fork to mash the yolks. Set aside the egg white halves. Step 2. To the small mixing bowl, add the onions, pickles, miracle whip, salt, and paprika. Stir until combined. Set aside. Step 3. Open and drain the can of olives. Cut 16 olives in half. 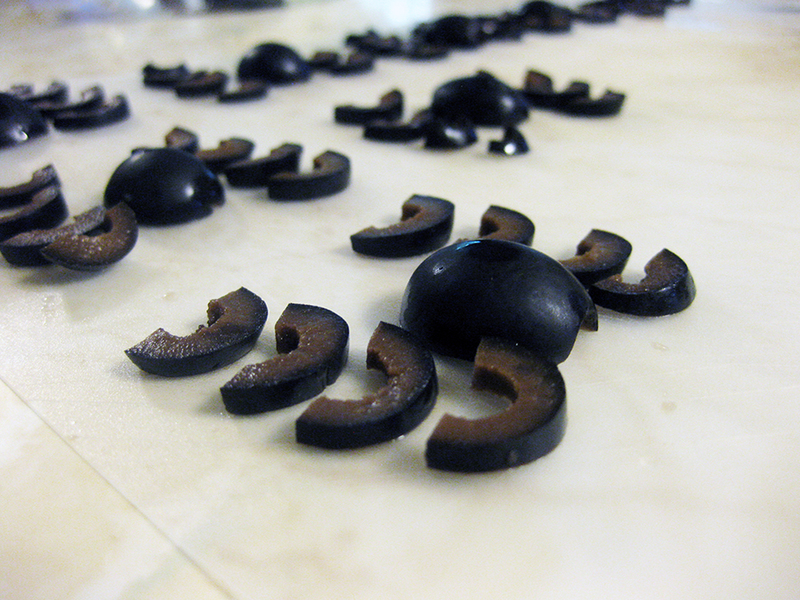 Set aside 8 olive halves — these will be the spider bodies. Cut the remaining 24 halves into 1/8 inch wide slivers — these will be the spider legs. For easy decorating, arrange the spider legs around the spider legs (see photo to the right). Step 4. Scoop one heaping tablespoon of the filling into each egg half. Use the back of the spoon to spread the filling towards the edges of the egg but make sure to leave about 1/4 – 1/8 inch rim. Step 5. Gently press the olive halves (the ones you set aside in Step 3) into the center of each egg half. 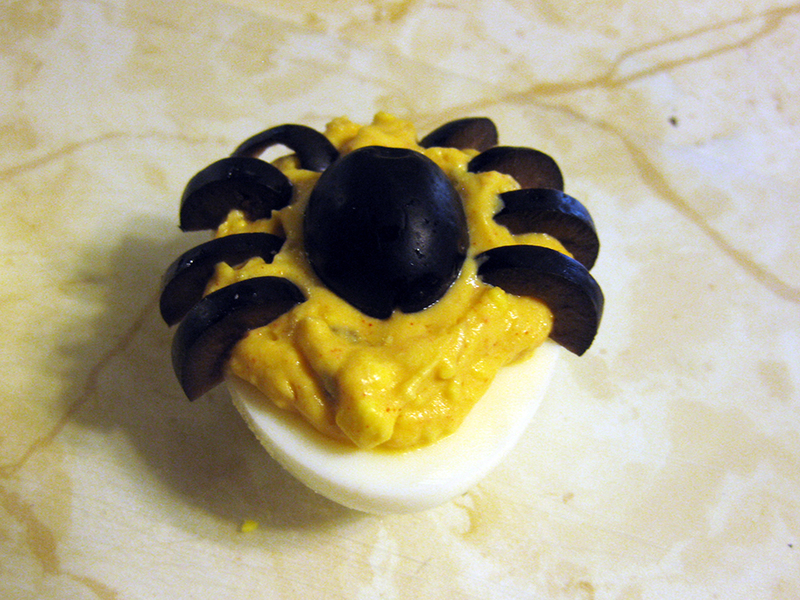 Carefully pick up the spider legs and gently press one end into the deviled egg filling. Place 4 legs on each side of the spider body. Aren’t these the cutest little things?? Posted by SprinkleOfHappiness on October 22, 2015 in Appetizer, Holidays! I’m not a big sweets fan, but I do love this recipe. It’s a hit at parties and people always ask me for the recipe. It’s the perfect balance of sweetness and freshness with a little crunch. I hope you love it as much as I do! * If using a rectangular aluminum pan, you will need 1 1/2 packages of cookie dough. I used the left-over cookie dough to make cookies. 1. Heat oven to 375. PAM the disposable aluminum pan. 2. 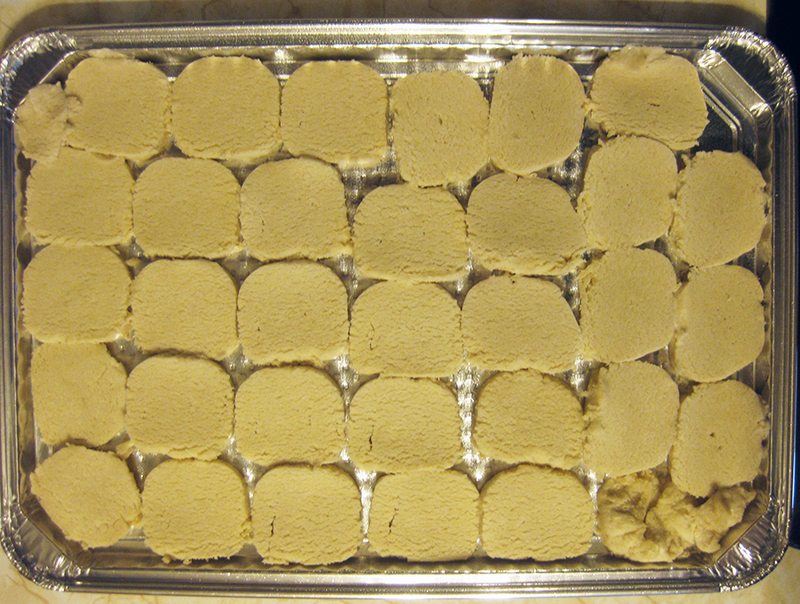 If using a rectangular pan, cut the cookie dough into 1/4 inch thick slices. You might also need an additional package of cookie dough. If using a round pan, cut the cookie dough into 1/2 inch thick slices. Place the cookie slices around the pan, just touching. Starting in one corner, gently press the cookie slices towards the edge of the pan, forming a slight lip. Continue around the remaining edges of the pan. Once the edges are complete, repeat with the remaining cookie slices until you have an even crust. Bake for 12-15 minutes or until lightly golden-brown. 3. In a small mixing bowl, combine the cream cheese, powdered sugar, and vanilla. Using a hand mixing or standing mixer, beat until blended. 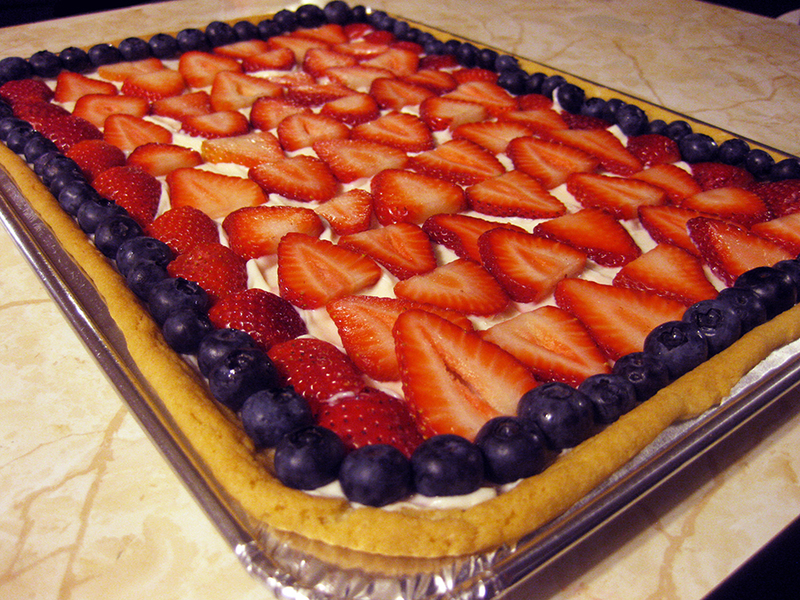 Spread the cream cheese mixture evenly over the baked cookie crust. 4. Rinse off the blue berries and strawberries. Slice the strawberries into thin, 1/4 inch thick slices. 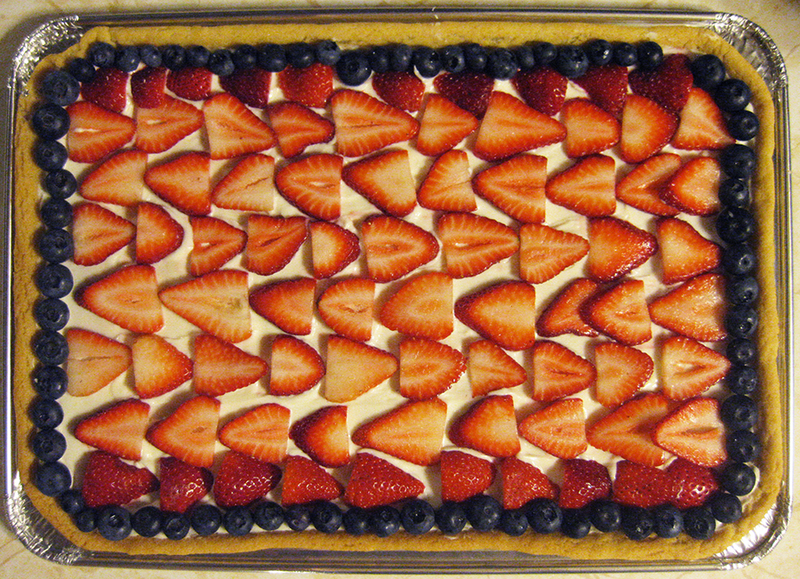 If you want to use the design I used in these images, separate the strawberry edges from the inner slices. Begin with the outside edges of the pan. Line the outer edges of the strawberries along the edges of the pan. For the inner lines, use the inner slices of the strawberries. As you can see in the image below, each line of strawberries alternate directions. Once your design is complete, create a border with the blueberries. Based off of the recipe found at Kraft Recipes. This recipe contains 4 servings of 1 lean, 2 greens, 1/4 healthy fat, and 3 condiments. 1. Preheat oven to 400. 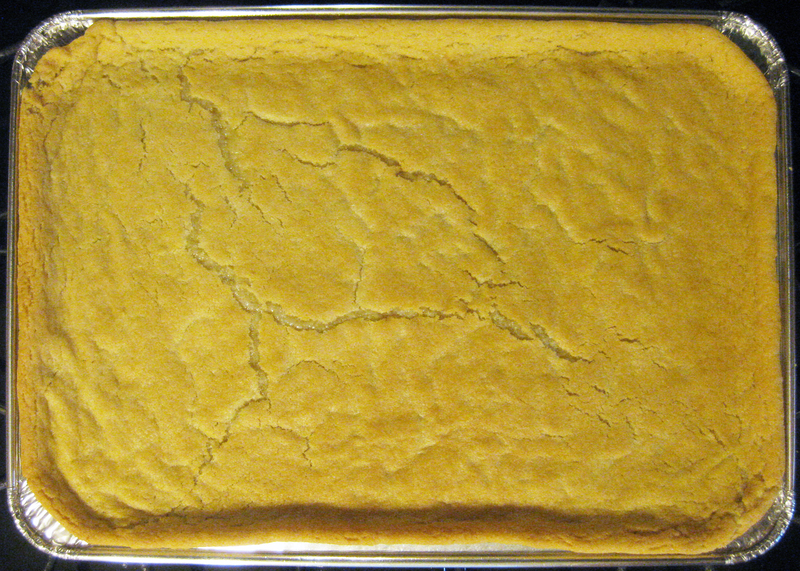 PAM a 9×9 baking dish. 2. In a medium bowl, combine the raw chicken cubes, light sour cream, ½ tsp garlic powder, and ½ tsp ground thyme. Stir until the sour cream and seasonings are evenly distributed. 3. In a large skillet, melt the butter or margarine. Add the onions and garlic. Cook over medium heat until fragrant and soft, about 7-10 minutes. Stir in the broccoli and water. Cover and cook for 10 minutes. 4. In a medium skillet, cook the spinach until soft, about 10 minutes, stirring occasionally. 5. 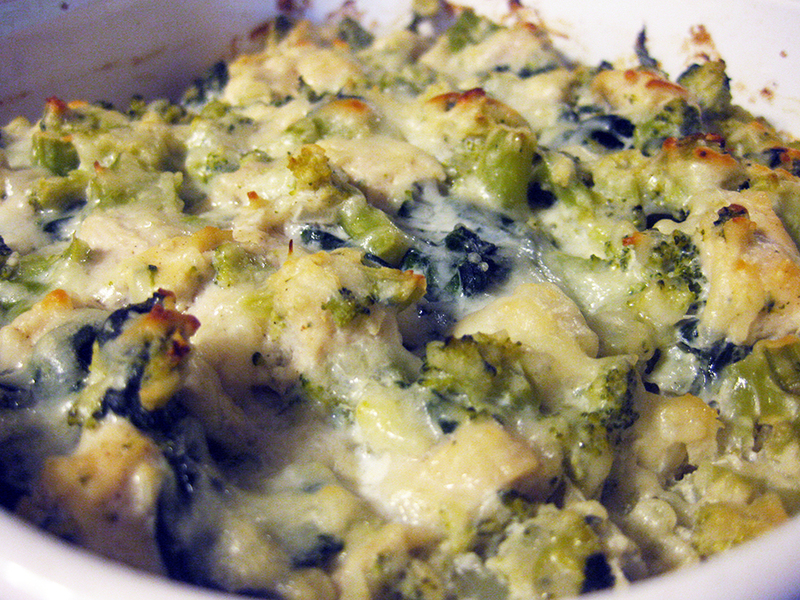 In a large bowl, combine the broccoli mixture, spinach, and chicken mixture. Stir until combined. Add ½ the cheese and stir. 6. Pour the mixture into the casserole dish and top with the remaining cheese. Bake covered for 20 minutes. Remove the cover and bake for an additional 20 minutes. These take a little white to assemble, but the adorable outcome is well worth it. 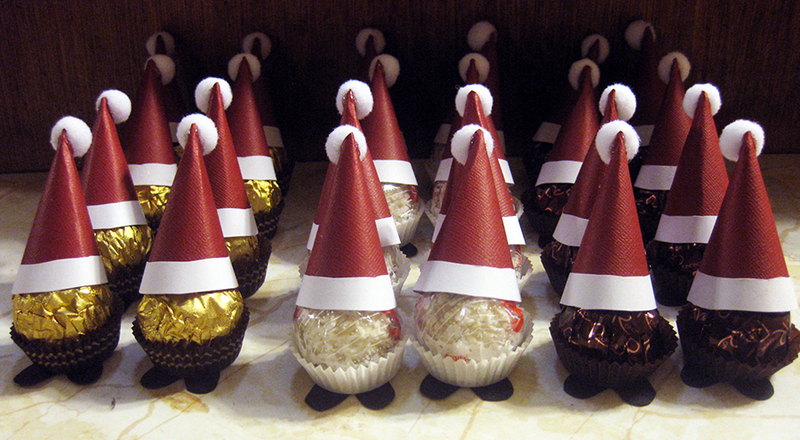 These little guys are perfect gifts for co-workers, teachers, or friends. This craft can also be adapted to other types of candy, such as Hersey’s Kisses or Reese’s Peanut Butter cups, which would be perfect for children. Step 1: Print the Santa Hat Template and cut out the pieces. The Santa hat will be red, the rim for the hat will be white, and the boots will be black. Trace the pieces onto the correct color of scrapbook paper. Repeat to create as many sets as you need. I used 2 12-packs of Ferrero Rocher, so I cut out 24 of everything. Step 2: Gently bend the Santa hat into a cone shape. The edges do not have to touch at the top, but they need to overlap 1/4 inch at the bottom. Apply hot glue to the part of the cone that is overlapped and gently press the overlapping part onto the hot glue. Hold for 5 seconds. Step 3: Apply a small pea-sized amount of glue onto the white craft puff ball and gently press onto the back side of the top of the red cone. Step 4: Use the glue stick (not hot glue gun) to apply glue to the back of the white rim for the Santa hat. Starting in the front of the hat, press the middle of the rim onto the hat. Try to leave a 1/4 inch overlap so the rim hangs off of the red part of the hat. Gently press the rim onto the rest of the hat and hold for 5 seconds. Step 5: Use the glue stick to apply glue to the bottom 1/4 inch of the boots. Gently press the glued part of the boots onto the bottom edge of the chocolates. Hold for 5 seconds. 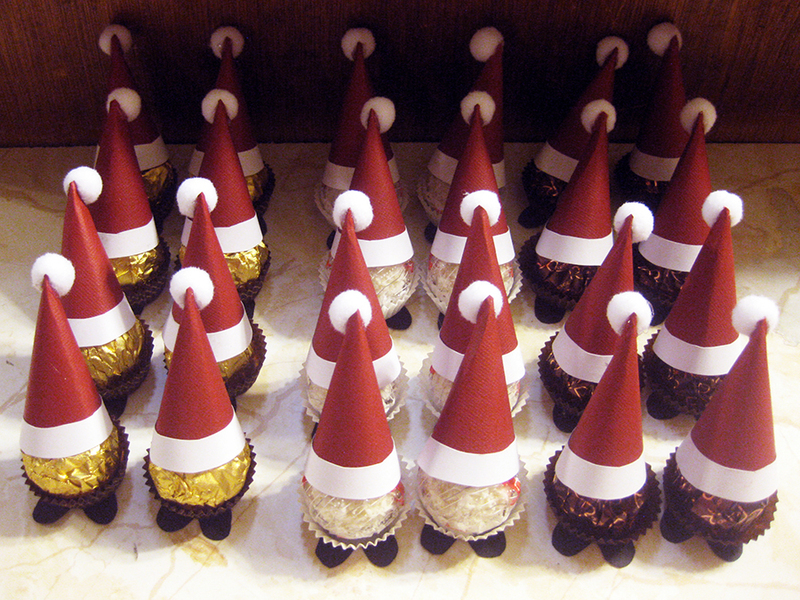 Step 6: Apply a small amount of glue to the inside of the back of the Santa hat, place the hat onto the chocolates, and gently press the hot glue to the chocolates. Hold for 5 seconds. Posted by SprinkleOfHappiness on December 22, 2014 in Holidays! 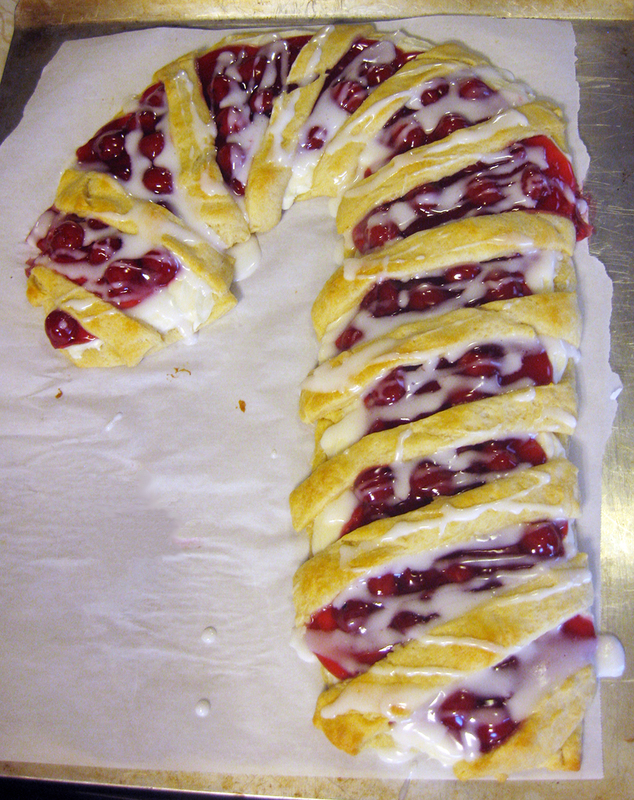 I’ve been told by several people that this is the best danish they have ever had. You be the judge. It’s very simple to put together and looks impressive. Would be a great recipe to make Christmas morning with the family. Step 1: Preheat the oven to 350. Line a cookie sheet with parchment paper. 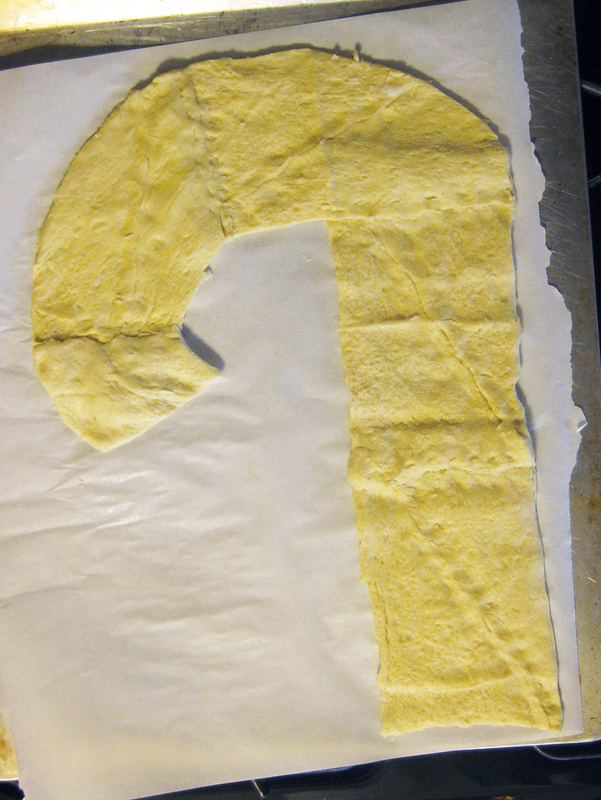 Step 2: Separate the crescent rolls into 8 rectangles by pressing two triangular sections together. Set aside two of the rectangles for later. 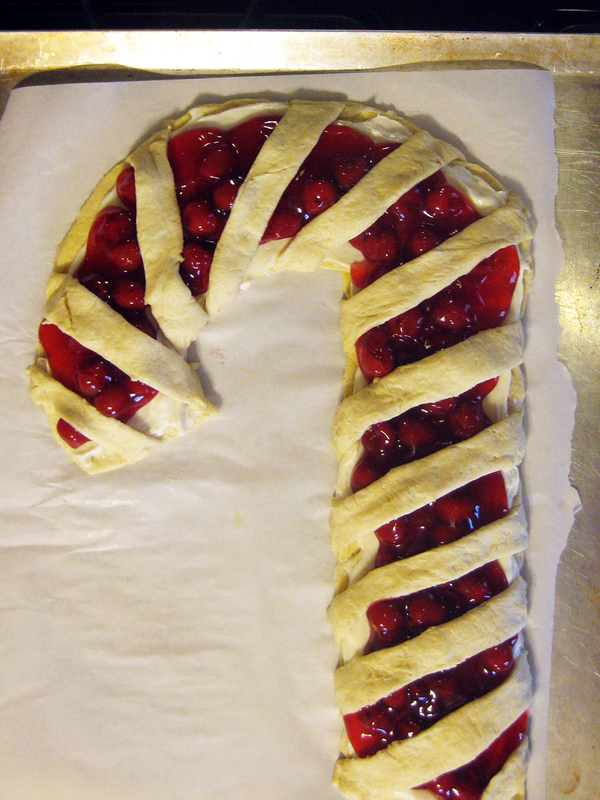 Arrange the remaining rectangles into a rough candy cane shape. I only used 5 rectangles, so I had 1 rectangle left over. I used it to make a small cherry popover. 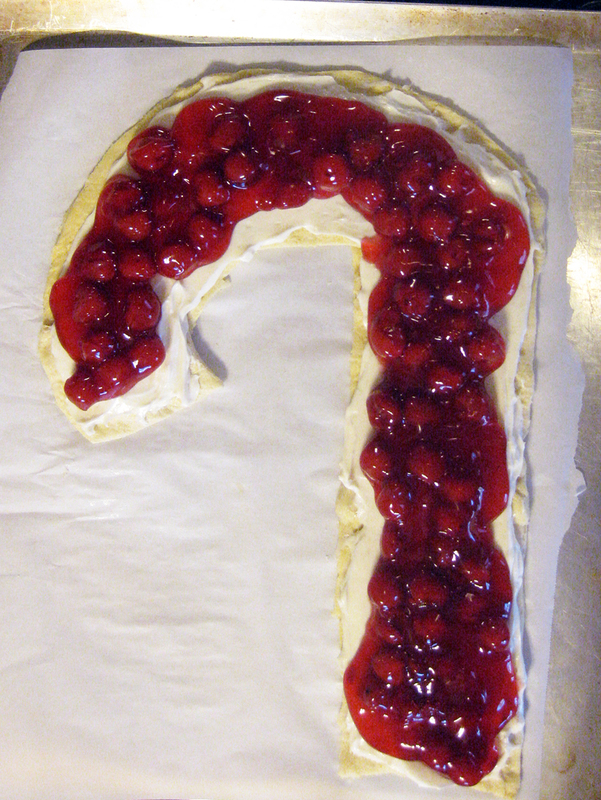 Step 3: Using a paring knife, trace a rounded candy cane shape. When you’re happy with the design, use the knife to cut off the remaining dough. Some of the pieces may overlap quite a bit. If this happens, cut off some of the overlap. You only need 1/4 inch overlap. Pinch the pieces together. Step 4: Combine the cream cheese and 1/2 tsp vanilla extract. 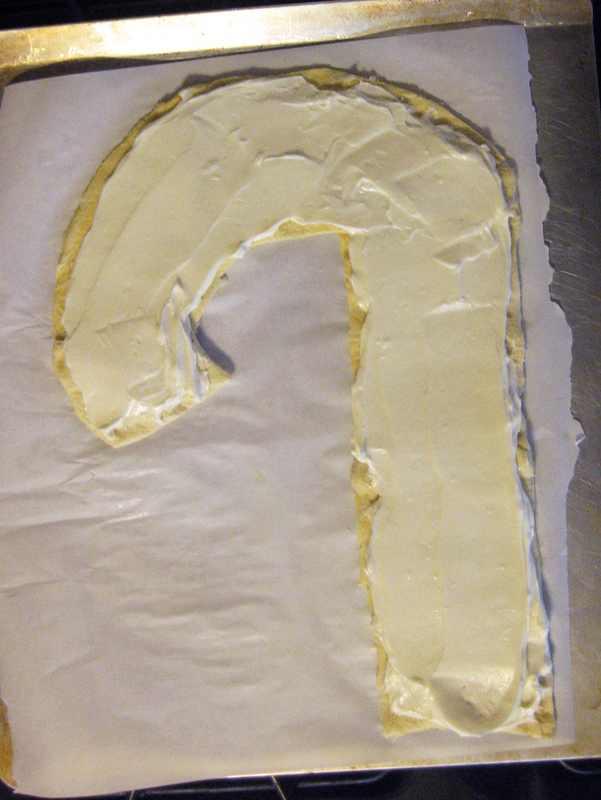 Spread the cream cheese ontop of the crescent dough, leaving a 1/4 inch boarder around the edge. Step 5: Open the can of cherry pie filling. Starting in the middle, carefully spoon the pie filing onto the cream cheese. I say be careful because the juice in the pie filling will spill over the edge if you’re not careful. 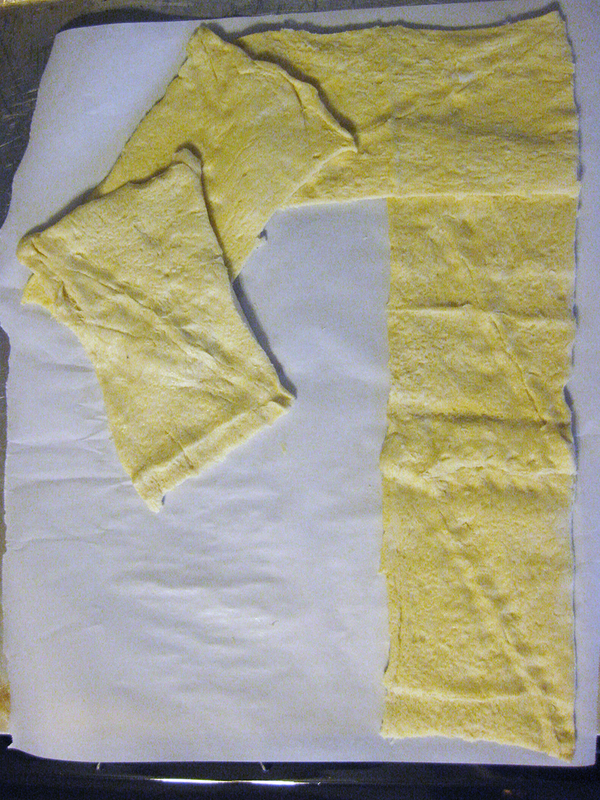 Step 6: Using a paring knife, cut the two rectangles you set aside in step 2 into 6 strips each. Gently stretch these strips and lay them across the candy cane to make the stripes. Gently press the stripes into the edge of the danish to secure the stripes. 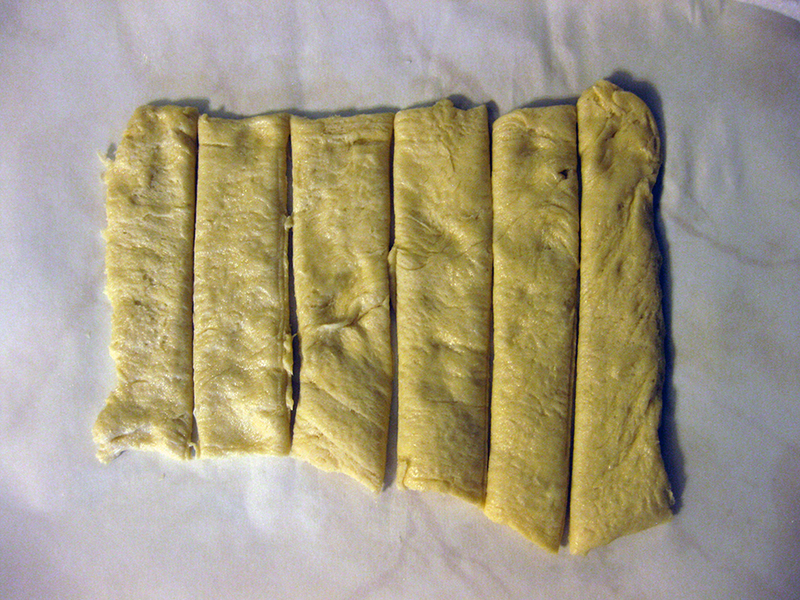 Step 7: Bake for 10-12 minutes or until the dough is golden brown. Step 8: While the danish is cooling, make the glaze. Combine 1 cup powdered sugar, 1 tbsp milk, and the remaining 1/2 tsp vanilla extract. Stir well. If the glaze is too runny, add more powedered sugar. If the glaze is too thick, add more milk. Once you’ve reached the right consistency, drizzle the glaze over the danish. This recipe is great severed hot out of the oven or room temperature. Enjoy! This is a great edible craft for kids. I’ve used this recipe while babysitting a 6 and 3 year old and they both loved it. 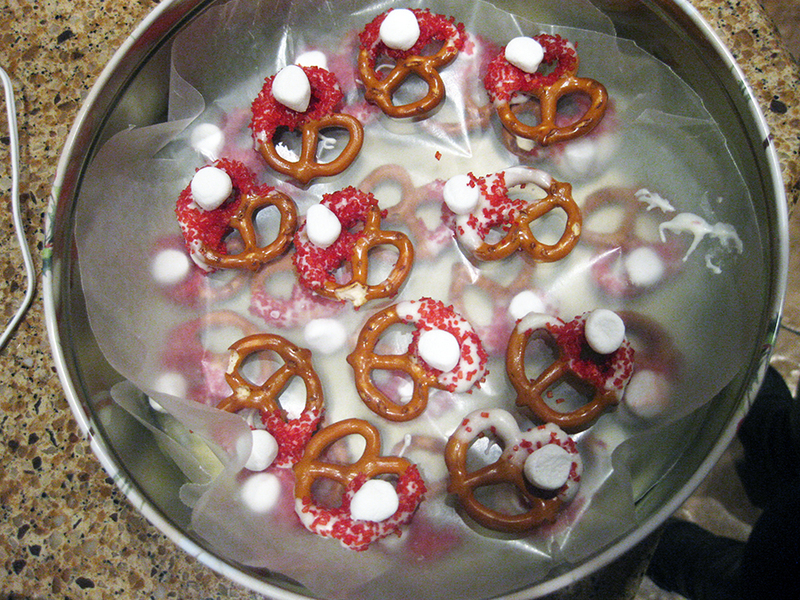 These pretzels look and taste great! Enjoy! Step 1: Pour 1 cup of the Hershey’s White Chips into a small microwave safe bowl. Microwave on high for 30 seconds, stir, and microwave in 15 second burst until the chips are completely melted. Step 2: Holding onto the bottom of the pretzel, dunk the top of the pretzel into the melted white chips. Pull the pretzel out and place onto wax paper. 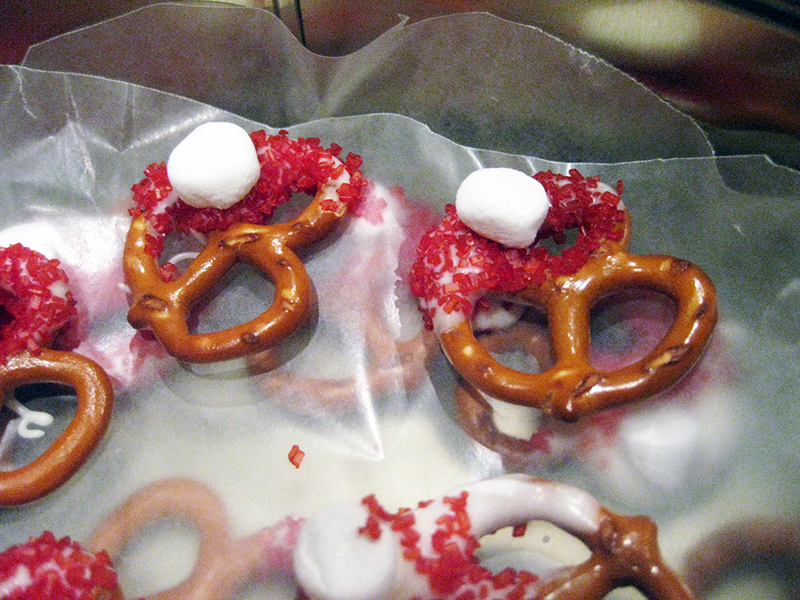 Step 3: Sprinkle the red sprinkle over the coated part of the pretzel. Step 4: Cut a mini marshmallow in half. Stick the marshmallow onto the coated part of the pretzel. Repeat until your heart is content! Based off of the recipe found at Oriental Trading.